This week we are starting a new segment where we will highlight a favorite resort or hotel. 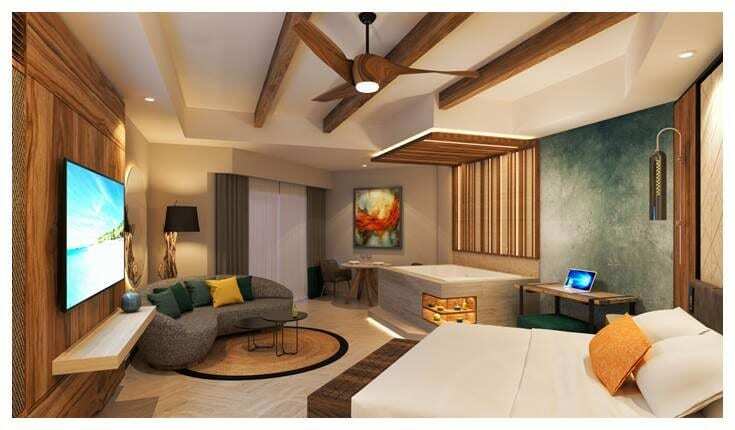 For our fist Hotel Spotlight segment, we are showcasing the newly renovated Hilton Playa del Carmen. Read on for everything you need to know about this stunning property! 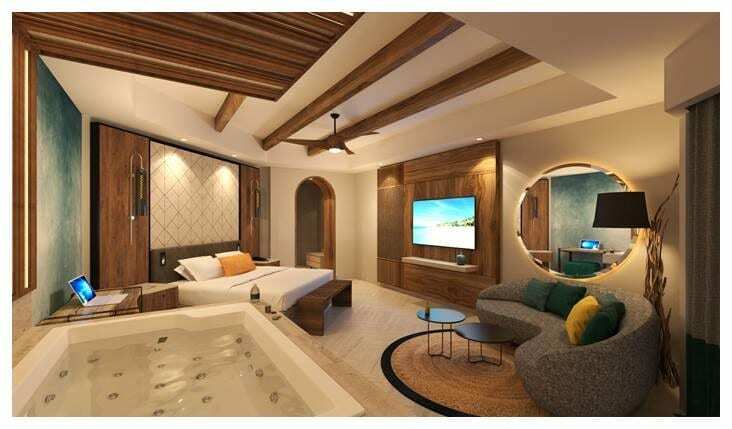 The Hilton Playa del Carmen has been re-branded from the former The Royal Playa del Carmen. 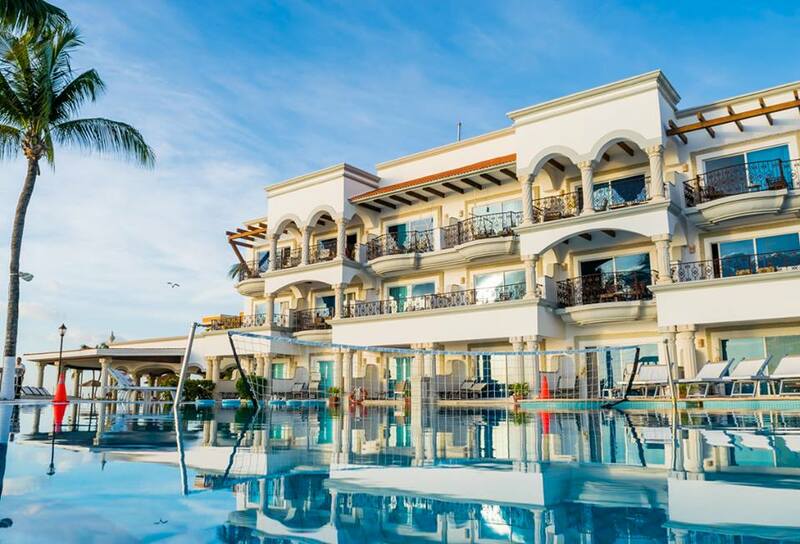 If you stayed at The Royal Playa del Carmen in the past, you can expect the same gorgeous property but with Hilton’s unprecedented level of service. This is a great option for groups or couples because it is exclusively for adults. To make this property even more luxurious, Hilton completely renovated their rooms and suites. Check out the photos below! Hilton Playa del Carmen can expect a multitude of luxuries when they book an all-inclusive stay. You’ll find 7 restaurants, 5 bars and lounges, and 24-hour in-suite dining. Dining options include oceanfront dining, a tequileria and cigar club, and tons of different cuisines. There are also tons of different suite options to choose from. You’ll find swim-up suites and beachfront walkout suites. In addition, each and every suite above ground level has its own private balcony and double jetted tub. Hilton Playa del Carmen also offers an abundance of activities for it’s guests, including gorgeous pools and beaches with drink and food service, a fully equipped fitness center, introductory scuba lessons, cooking demonstrations and tequila tastings, Zumba and other dance classes, non-motorized water sports, and live nightly entertainment. Location, location, location! This is a great property for those who want to venture off property for nightlife, restaurants and bars, or shopping. Located just steps from Playa del Carmen’s famous Fifth Avenue, Hilton Playa del Carmen brings you the best of both worlds. 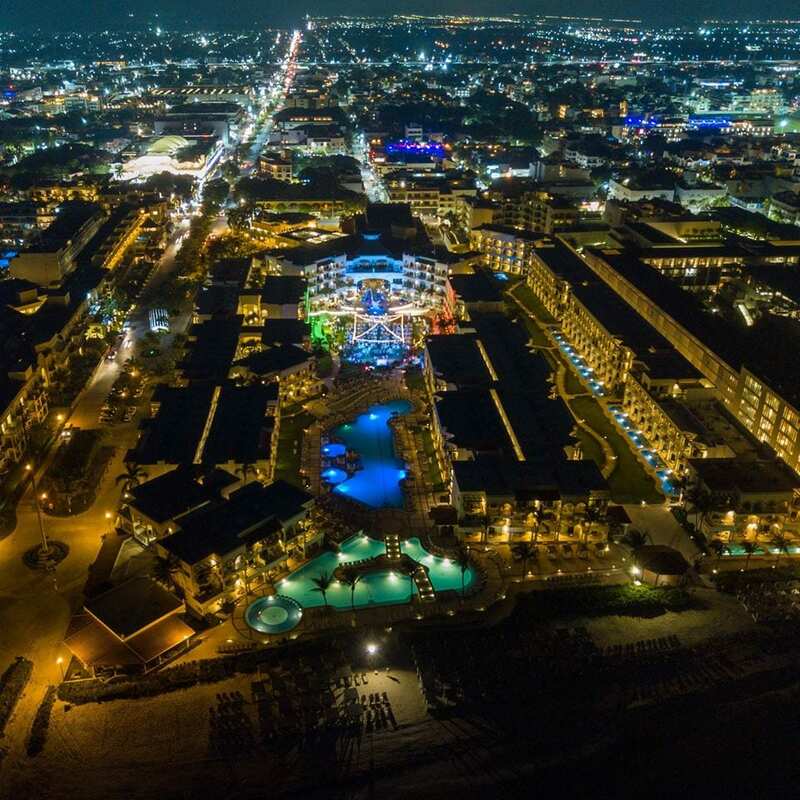 With all-inclusive luxury, restaurants, bars, pools, and beach on property and adventure and more on Fifth Ave, you’ll never get bored here. This unique property will keep you occupied both on the resort and off! Plan a group getaway for an adventurous crew here, or a romantic getaway to explore the hidden gems of Fifth Avenue. Whatever you decide, you’re sure to have an amazing experience. If you are not familiar with Playa del Carmen’s amazing 5th Avenue, you’re in for a treat. Called “Quinta” by locals, this pedestrian street runs parallel to the beach and has a ton of options for shopping, dining, and entertainment. The most popular and busy area runs from Calle 3 sur (south 3rd street) to 40th Street. It includes about 22 blocks of shopping and dining options. Starting on the south end, you’ll begin at Paseo Del Carmen shopping plaza. This shaded area offers mostly clothing and souvenir shops. Once you past Paseo Del Carmen, you can skip the area between this and Calle 1 Sur as it is very cheap and tacky. Once you make it to Calle 1 Sur, the area between this street and Juarez Avenue is known as Parque Fundadores. This is a really exciting area and a great place for families, with a kids play area. There is even handicap beach access here. In addition, you’ll find papantla dancers throughout the day and Mayan dancers once sun sets. Be sure to check out the little white church on the corner of Parque Fundadores. It is a historic site and you will see it used on Sunday mornings. You can even attend a service here if you wish. If you are looking for American brands and shopping opportunities, head to the intersection of 12th Street where you will find Calle Corazon shopping mall. You’ll find stores like H&M, Sephora, and more. 12th Street also has a lot to offer in the way of nightlife. The night clubs and bars stay open here until 5 AM! Contact us today to book your own stay at Hilton Playa del Carmen. You can reach us at 402-390-9291 or get started here.